One thing I've never really owned is a nice pillow. I've tried a couple "nicer" pillows, but they never conform to the shape I need. I am extremely picky about what I use. I don't know if any of you are the same, but I actually sleep face down into the pillow. I'm not sure if it's normal or not, but everyone in my household seems to think it's weird. Because I sleep face first, I like my pillow to be a very particular way. It can be too soft because then I sink in and can't breathe as well, but it can't be too hard, because.. well that's my face, and I don't like my face resting on hard things, lol. 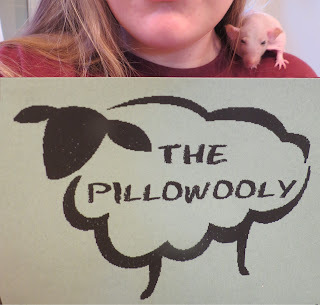 So when I was reading about the Pillowooly from BuyGreen.com, I was very ready to try it out! See, the Pillowooly is filled with wool - But the pillow has a zipper, so you can take out as much of the wool as you want to adjust the pillow to your specific wants. I took out a little bit of the wool, but I actually liked it just about the way it came. 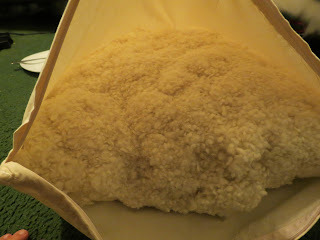 BuyGreen.com also sells extra bags of wool, so if you want to add more wool to your pillow, to make it really firm, you can do that as well! Now - On to my favorite feature of the pillow. Not only is this pillow "green," but it also has several benefits! Before doing this review, I had no idea how beneficial wool was! Sounds pretty awesome huh!? I plan on having my Pillowooly for a long time to come - It's just so comfy, and there is no denying the benefits! Disclosure: Review product was provided to me free of charge. All opinions expressed are my own, and were not influenced in any way. Facebook is not associated with this giveaway. This giveaway will end on May 30th, 2012 at 11:59 pm. Winner will be drawn via Random.org, and winner has 48 hours to respond to my email, before a new winner will have to be chosen. **If Tweeting, you must have an "unlocked" account. Sponsor is responsible for shipping the prize to the winner.This giveaway is open to the US Only. I would love to have the Cherry Lover's Eco Cuff! I would love some Pure Beeswax Aromatherapy candles. The Bamboo Reusable Water Bottle is something I'd love to use. Thanks for the opportunity. I would love to have the bamboo hooded towels! Pangea body wash in Pyrenees Lavender with Cardamom. I'd get the Max Air composting bucket with BioBags waste bags. I like the Eye Candy Large Purse in tutti fruiti. I would love to have the Sherpa Flashlight because it's rechargeable! I would love to try any of the bath products or skin care. They look awesome. I see your cute little hairless rat!! I like the zogoflex dog toys. I like the Fire Truck for my grandson. wow, I have never seen a pillow like that before! I would like the Stainless Steel Salt and Pepper Shaker.